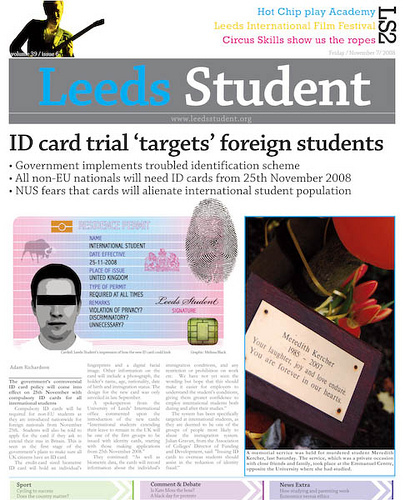 Since graduating from Leeds University I’ve followed the path of the student newspaper, Leeds Student, with keen interest – I spent almost two years of my time at Leeds working on the newspaper and owe my current career to the experience gained writing and designing for it. In the era of “digital first”, though, I’m starting to re-examine how student journalism fits into the bigger picture of newsmaking. Monday: Not much to do production wise as most commissioned content wasn’t written yet – some basic page layout work done in preparation. Tuesday: A few early things had usually come in at this point and stories were being chased by the news team. Wednesday: Last full day of production before going to print. If articles hadn’t come in at this point it was usually time to dash off a quick piece on Israel vs Palestine or something to fill the extra pages. Thursday: Deadline day. Always manic, we’d be up in the office wrestling with Quark Xpress with the vain hope of finishing before the pub quiz started at 8:30pm, but sometimes taking until the early hours to finish. Friday: After a nice lie-in, distribution of the new issue around campus began, followed by production planning for the next week’s edition. Interested writers would come to the evening meeting and we’d hand out stories to write and photos to take. We’d write down the plan for next week’s issue and go to the pub. It was a huge part of my student life and I loved every minute of it. After finishing university I moved on to work as a designer at a local magazine in Leeds, and from there moved to the Guardian where I work on the website. With the Guardian’s recent announcement that it plans to be “digital first”, I began to wonder about how this would affect the students still working on Leeds Student. I knew from conversation with former editors that the paper costs the Student Union a fair amount of money to print, and the number of issues per academic year continues to decline as Leeds University Union (LUU) reduces its budget. I also know that the paper continues to use fairly old copies of Quark Xpress for layout, rather then Adobe InDesign which seems to have won the battle to be industry standard a fairly long time ago now. Every year, the newspaper’s editor is elected from the student body, and every year (that I was around for, anyway) the potential candidates (myself included) promised to “improve the website”, with more recent campaigns including promises of mobile sites and apps. What tended to happen, though, was that the website was gradually relegated to a lower priority than the print edition, which took far longer to produce. Stories were originally only uploaded the day the print edition came out, meaning none of the web’s advantages for breaking news were taken advantage of. In more recent years this was improved with an upgrade to WordPress blogging software and more frequent updates (and even that mobile site) – fantastic. Most journalists for larger media companies don’t tend to use page layout tools personally, leaving these to trained designers and specialists. Even the most dedicated teams would struggle to produce anything more frequent than a weekly newspaper – the comparative amount of time spent producing the print edition reduces the amount of time available to research and develop stories. As print consumes time and money, journalists have little time or energy to not only put their stories online, but to curate them and promote them – content is often left as an afterthought. Are student journalists missing out on the most important aspect of journalism – breaking news quickly and creating dialogue? I think so. When Leeds Student went to print, we’d all get huge satisfaction from seeing students around campus leafing through that morning’s copy. The first time I saw a real debate being fostered in the comments section below the line on the website, however, I felt totally vindicated. Students inherently understand the internet and social media in a way many professors of journalism and veteran hacks struggle to do. I remember avoiding work in the library, reading Facebook, playing with my phone, anything to avoid actual work. The news needs to reach people where they’re already looking, not depending on them having physical access to a limited number of printed copies. To check this wasn’t just my digital bias talking, I recruited the opinions of several of my former Leeds Student colleagues, most of whom are now working in the media since graduation. Here are a few of their comments. York Uni have a very restrictive stranglehold over the editorial policy of their two newspapers (Nouse and Vision, last I remember) so some disgruntled students who wanted an independent paper set up The Yorker. I believe it worked *very* well, and had a pretty good readership across campus even though it was independent. It was nominated for a Guardian Student Media Award in the first year it ran, which is generally a good sign. 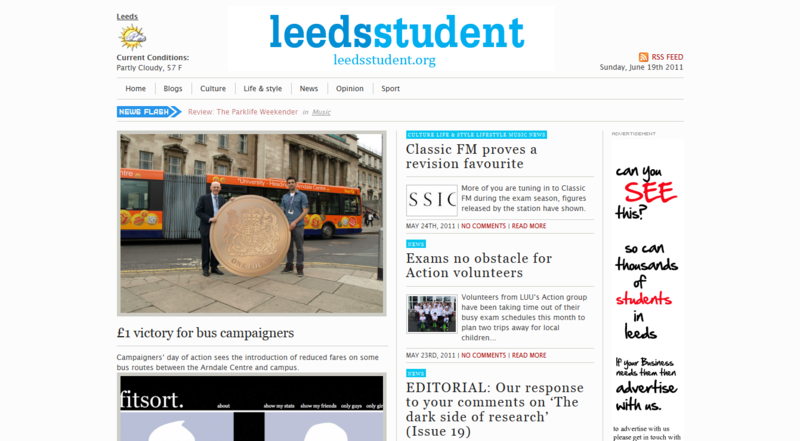 The reason it was popular with students, I think, was that it was updated as stories broke, meaning there was continually new content, unlike the once-weekly updates we had on the Leeds Student website back int’day. This reminded me of a famous story in the Leeds Student annals from a couple of years ago. The paper published an interview with a Palestinian journalist who answered a question on supposed pro-Israeli coverage in the mainstream media by saying “you have to ask yourself who controls the media”. A student working on LUU’s student executive took offence to the anti-Semitism he felt the comment contained, and locked all of the copies of newspaper in his office, refusing to allow distribution until the offending line was crossed out. After a bitter squabble which ended with the officer resigning his post, the paper was released for publication. The point here is that when working with academic institutions, students are as bound to their “proprieter’s” whims – if someone from the top decides the content is inappropriate, then it’s gone. This has potential to be abused – what happens when the paper wants to report critically on the university or the union? The website is effectively outside of the control of these bodies – it’s hosted on external servers (in the USA, I believe, for good measure) and access is controlled by the journalists themselves. Shutting this site down at the first mention of controversy is not as easy as locking up a pallet of newspapers. Rob’s point above suggests that Leeds was not the only university to experience tension between student journos and those in authority – the web is the answer to this. Distribution isn’t really that big a problem – so long as you remember to keep filling the stands they always go and it would be a shame to get rid of papers in an environment where the concept of a physical paper actually still works! Laura’s tenure saw increased usage of the website and even the early stages of development of a mobile app to complement the mobile-friendly template the site had introduced. I remember one of my favourite Friday morning rituals at university of coming in early to grab a freshly-printed copy of the newspaper and sitting down with a sandwich for a read. It would be a shame to lose that, and I understand people’s attachment to the physicality of the output – certainly working as hard as we did to produce it, it felt a lot more tangible seeing the results in print than it did on a screen. Quick poll: would you be bothered if "your" newspaper dropped its print edition to focus on website, mobile and tablet versions? How much? Paul said “I tend to read a physical paper when I go out for meals. I’d take a magazine or book before an iPad”, which I agree with. Neil offered “Mostly, I read the paper on the commute. I also like the format of hard copy better; easier to find everything”, which I again agree with – I think this stems from the ‘infinite’ nature of online. A print paper has a discernable start and end; online, you could read for a year. Some papers offer ways online to read that day’s print edition cover-to-cover, but perhaps this misses the point of breaking news (or anything published since the previous night, really). I think I know which side I’m coming down on, but it’s certainly not clear-cut for everyone. Nobody knows exactly what the future of print is, but for forward-looking publications like The Guardian, where print sales are rapidly falling, digital seems to be the direction of expansion. If you’re a journalist, why wouldn’t you want your articles to be read by more people on more platforms? The nostalgic attachment to print can be somewhat misplaced – the format is just a format and one isn’t inherently better than another, it’s about context. With that in mind, digital works best for students. As consumers, students are already web-savvy and are used to looking for their information online first. As journalists, students should be graduating having learned the skills of crowdsourcing information, responding to their (often irate) readers, using web analytics, SEO and social media. Print experience is a bonus, sure, but in 2011, perhaps it’s time that we view it as an outmoded skill from a time when there was only one way to make news.